One year after it debuted to critical acclaim, the Cadillac ATS receives a standard frameless inside rearview mirror, a sport steering wheel with a thicker rim for models with paddle shifters, and a 110-volt power outlet for models equipped with the optional CUE and Navigation Package. The Driver Awareness and Driver Assist option packages contain new Intellibeam automatic high-beam headlights. Four new colors are available, and dealers offer several new accessories for 2014. Luxury models add leather, power front seats, Keyless Access, remote engine starting, parking assist sensors, and a reversing camera. Performance versions have front sport seats, a premium surround sound system, numerous safety upgrades, and with the V-6 engine, shift paddles. The Premium collection includes navigation and a head-up display. 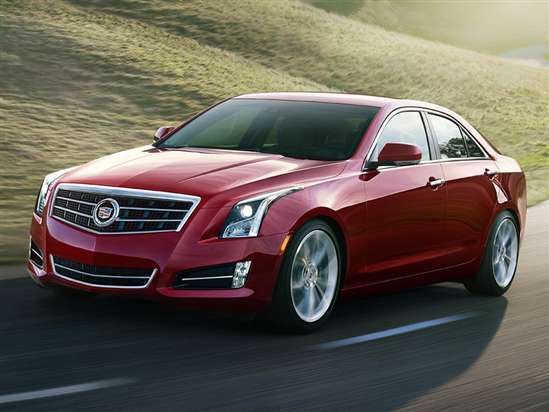 The ATS 2.5L is equipped with a 2.5-liter 4-cylinder engine rated to make 202 horsepower. It drives the car’s rear wheels through a 6-speed automatic transmission. A turbocharged 2.0-liter 4-cylinder engine powers the ATS 2.0L Turbo. It makes 272 horsepower and, perhaps more important, it provides 260 lb.-ft. of torque between 1,700 rpm and 5,500 rpm. A 6-speed automatic transmission is standard, and this model can be equipped with an optional all-wheel-drive system. Stick with the standard rear-drive setup, and a 6-speed manual gearbox is offered as an option. The most powerful ATS is the 3.6L version, which has a 321-horsepower, 3.6-liter V-6 engine. A 6-speed automatic transmission is standard, and all-wheel drive is optional. In combined driving, the ATS 2.5L is rated by the EPA to return 26 mpg. Choose the ATS 2.0L Turbo and the car gets 24 mpg with the automatic transmission, 23 mpg with the manual gearbox, and 23 mpg with AWD. The ATS 3.6L is expected to travel 22 miles for every gallon consumed, unless the V-6 is paired with AWD. In that case, it is rated to get 21 mpg. In crash tests performed by the National Highway Traffic Safety Administration (NHTSA), the ATS receives an overall rating of 5 stars, the highest possible. The Insurance Institute for Highway Safety (IIHS) had not tested the ATS as this overview was written. Cadillac User Experience (CUE) is standard for every ATS, equipped with natural voice recognition technology and controlling the car’s information, entertainment, and climate control system. Touch- and gesture-sensitive, CUE and its haptic-feedback response takes some getting used to. The ATS also comes standard with OnStar telematics, which includes Automatic Crash Response service and a RemoteLink Mobile App, and can be upgraded with FamilyLink service. Additional options include Adaptive Forward Lighting, Full-Speed Range Adaptive Cruise Control, Forward Collision Alert, Automatic Collision Preparation, Side Blind Zone Alert, Rear Cross Traffic Alert, Lane Departure Warning, a Safety Alert Seat, Intellibeam headlights, Front and Rear Automatic Braking, and more.